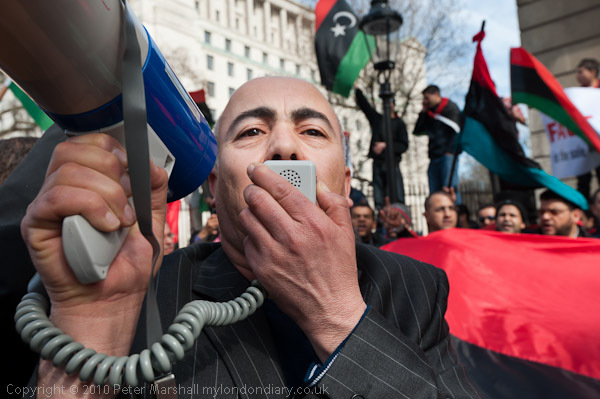 Last Thursday lunchtime around 500 or more Libyans came to demonstrate opposite Downing St, not like most demos to condemn the Con Dem alliance, but to thank them for their support of the ‘no-fly’ policy. They appreciate David Cameron’s efforts to persuade the UN to adopt the resolution that enabled French, British and US forces to take action against Gadaffi’s planes, tanks and heavy weapons. The people of Benghazi feel that it was only this intervention that saved many of them from death, with Gadaffi’s threat to take action against them street by street and alley by alley being very close to being put into effect as his tanks were poised on the outskirts of their city. 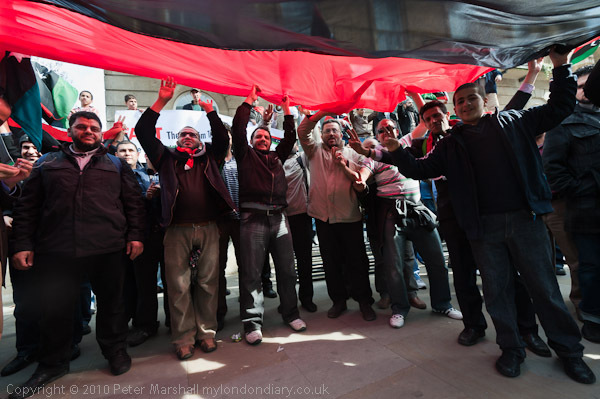 Libyans supporting the revolution and the Interim Transitional National Council running Benghazi and other areas that have broken away from Gadaffi’s rule have little time for the opposition of the British left, although they seemed also clear that they wanted to set very definite limits on the foreign intervention, and that eventually they will have to liberate their country themselves. So although they very much welcomed the efforts the British government has made so far, they have other demands, particularly for recognition of the ITNC as the legitimate government of Libya, but also to be able to import the arms and ammunition that they need to carry on the fight. Perhaps the left instead of simply calling for an end to the UN resolution backed military intervention should now be pressing hard for the kind of policies that would enable Libyans to stand up against Gadaffi and defeat him. Without the bombing of the last week it seems almost certain the Libyan revolution would have been crushed by now, at least for the foreseeable future. It was a lively event, and one where people were very keen for me to take pictures, although just a little daunting to look at the packed mass of men noisily protesting. But once I had jumped in, everything was fine. Getting under the giant flag did give some exposure problems, and most of the pictures I took using flash came out over-exposed (these systems either seem to work perfectly or really mess up, with little in between, and often it is very hard to determine why things go wrong when they do.) In the end all of those I’ve used were taken without flash. Bright sunlight in the background and the shadow under the flag were rather extreme and needed quite a lot of persuading to produce the picture shown. The background was more than 3 stops overexposed, the foreground probably a stop or two under. The result above was a quick fix, and could be improved. Theoretically digital may have less latitude than negative film, but usually post-processing can usually more than compensate and I’m fairly certain I wouldn’t have managed this on film. It was all very much heat of the moment – I was only there around 6 minutes in all, I had hoped to go back and do some more but they packed up and left before I could do so. This entry was posted on Wednesday, March 30th, 2011 at 08:18 am and is filed under My Own Work, Photo Issues, Political Issues. You can follow any responses to this entry through the RSS 2.0 feed. You can leave a response, or trackback from your own site.